While the pared-back, funky and minimal facilities hotel model popularised by the likes of the Ace and Zoku may already be a familiar one in the West, it has yet to gain a significant foothold in Asia. 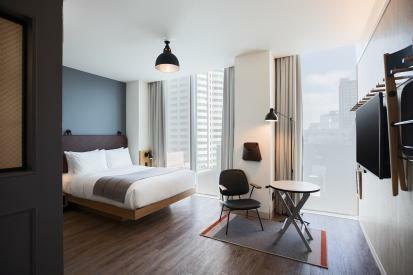 With the launch of its Moxy diffusion brand in Osaka, the Marriott group hopes to change all that. Geared explicitly towards a more adventurous and socially upwardly mobile Japanese clientele, the Moxy Osaka Honmachi is both a gamble and lively experiment in minimising extraneous elements without sacrificing comfort. Considerably aiding the cause is local based studio Wise Labo, who have taken an 11-storey undergarment warehouse and showroom in a quiet neighbourhood of hole-in-the-wall eateries, sushi bars and seal makers, and carved out 155 remarkably comfortable and spacious rooms. In the bedrooms panelled in rough-hewn timber veneer, tables and chairs (modified from the original Yabu Pushelberg designs) fold away when not required, and bulky wardrobes have been replaced by wall hooks, while bar fridges are relegated to the ground floor lobby cafeteria which is stocked with fruit-infused water, ice-cream, instant noodles, salads, snacks and tinned smoked fish. For road warriors, there are plenty of cosy nooks and work desks, alongside a large conference room and a surprisingly well-stocked gym.